I’ve seen To Catch a Thief a number of times. At first I dismissed it as fluff, but I have to say it’s grown on me over the years. Even if it’s not up there with Hitchcock’s best, it’s still a pretty interesting piece of work. It was released in the mid-fifties, halfway through a decade in which the director made a remarkable series of movies, including Strangers on a Train, Rear Window, Vertigo and North by Northwest. During this period Hitchcock created some of his most complex, challenging films, and amazingly, he also enjoyed a long winning streak at the box office. Like other directors who succeeded in Hollywood, Hitchcock understood that he was only able to hold on to his artistic freedom as long as he was able to produce money-making films. It was a balancing act. Sometimes he took chances, and his more daring projects didn’t always fare well at the box office. So he also made films that were calculated to please audiences, films that were conceived primarily as entertainment. Which doesn’t mean to say that To Catch a Thief is completely superficial. One of the things that makes Hitchcock’s work so interesting is that he could deliver a film for the mass audience that was still subversive. Here he gives us the beautiful stars, the sumptuous sets and the stunning location work on the French Riviera, but at the same time he manages to pose some questions about the glamorous lifestyle that were seeing on the screen. He’s feeding us a slice of cake, but he also makes a point of asking if this is what we should be craving. On the surface, the film’s tone is light and breezy, and John Michael Hayes’ script has a sharp wit that keeps us from taking it too seriously. The director is offering his audience a voyeuristic thrill by setting the film on the beautiful and luxurious French Riviera. Cary Grant plays John Robie, a gentleman jewel thief who’s gone straight. Grace Kelly plays Frances Stevens, a spoiled rich girl vactioning with her mother. Everything you need for a light, sophisticated thriller. 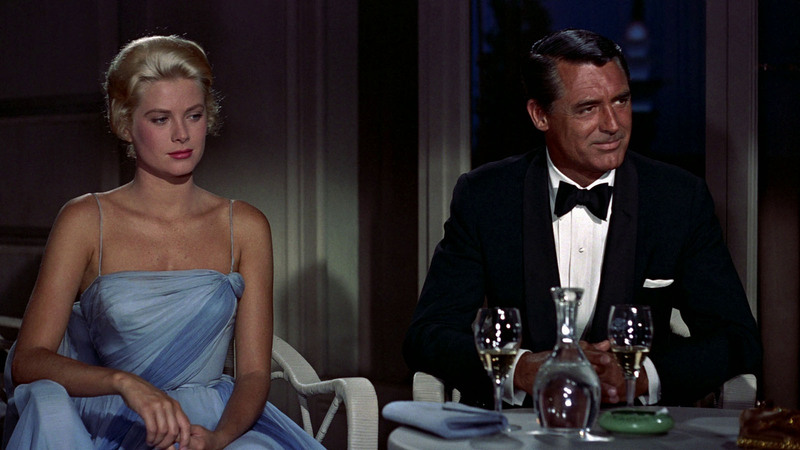 When I first watched To Catch a Thief, all I saw was the glittering surface. But on subsequent viewings, I started to catch interesting undercurrents. While Robie is a professional thief, the film makes the point that we’re all thieves in one way or another. Hughson, the straightlaced insurance agent who’s trying to recover the stolen jewels, gets uncomfortable when Robie calls him out on the fact that he’s padding his expense account. Hughson doesn’t like it either when one of his clients points out that selling insurance is basically gambling. And Frances, the headstrong heiress, wants to join Robie as a partner in crime, planning a robbery as though it was an amusing game. Throughout his career, Hitchcock kept reminding us that the line between law-abiding citizen and desperate criminal is very thin. The unfortunate heroine in Blackmail, the smug athlete in Strangers on a Train, the glib ad man in North by Northwest, all feel comfortably snug in their daily lives, until a twist of fate puts them on the wrong side of the law. The films may be fiction, but how many of us can say there hasn’t been a point in our lives when we could’ve crossed that line ourselves. It’s redundant to call attention to Cary Grant’s striking skill and suave assurance. He’s pretty much perfect as the reformed thief. And I don’t want to spend a lot of time talking about Grace Kelly’s deft blend of cool wit and casual confidence. I’d rather focus on the supporting cast, which is just as impressive as the leading actors. John Williams made a career out of playing proper Brits, but here he gets a chance to have fun with the role. His drily understated performance is a joy to watch. Brigitte Auber has a strong and lively presence as Danielle, the amoral girl who wants to lure Grant back to a life of crime. But my favorite is Jessie Royce Landis as Frances’ down to earth mother. Landis was often cast as a matron, but in her films with Hitchcock she got to show how much she could bring to those roles. She does what the best character actors knew how to do, and that is to take a type and turn it into into an individual. In this film she gives one of the most enjoyable performances I’ve ever seen on the screen. In making To Catch a Thief, Hitchcock was surrounded by an amazing team of collaborators. The film’s bright, crisp visual style was crafted by cinematographer Robert Burks working with art directors Hal Pereira and J. McMillan Johnson. Edith Head’s costumes add a layer of sumptuous style. George Tomasini worked as an editor on a number of Hitchcock films, all displaying a sharp sense of pace and rhythm. The only one of the director’s major collaborators from the fifties that’s missing is composer Bernard Herrman, but Lyn Murray’s score is enjoyable and energetic. The Hollywood system has always demanded that filmmakers bring in the bucks. Hitchcock knew he had to balance his more personal projects with mainstream entertainment. But he also knew that these more conventional films could hold unconventional ideas. To Catch a Thief may appear to be nothing more than a slick, mainstream movie, but underneath the smooth, seductive surface, you’ll find that Hitchcock’s cold, hard intelligence is still at work. An intense young man walks the streets of New York while a moody, abstract bass line murmurs to us in the background. A young woman stops under a bright theatre marquee to check out the lurid display as a rambling solo sax underscores the scene’s sexual tension. In John Cassavetes’ Shadows, the jazz soundtrack doesn’t just complement the visuals, it’s an integral part of the director’s approach. The spontaneity and sensitivity of the music reflects the loose, open-ended feel of the movie. It’s not just a different style. It’s a different way of thinking about film. The credits tell us that Shadows was improvised, which isn’t really true. 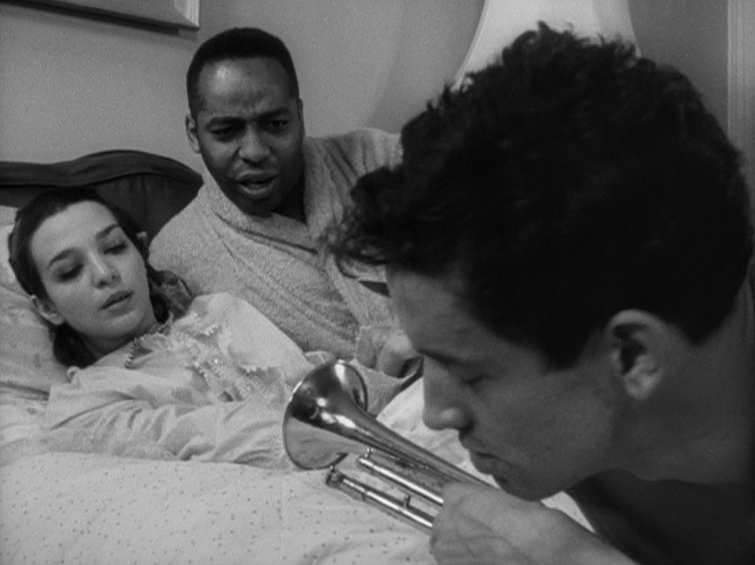 It did grow out of improvisations by the actors, and Cassavetes was open to their inspiration during the shooting. But even if there wasn’t a traditional script, the director had definite ideas about the film’s shape and structure. Cassavetes knew where he wanted to go, even if he didn’t always know how to get there. It was his first film, and he has acknowledged that it’s uneven. Shadows may be messy and chaotic, but its loose, freewheeling approach allows the actors to connect with us in ways they never could in a more conventional film. Just as a jazz musician takes a melody and makes it their own by opening themselves up to the moment, Cassavetes and his collaborators start with a basic structure and allow themselves the freedom to be spontaneous. They’re not locked into the demands of a commercial film, where the story is crucial and everything is planned and prepared. They take chances, they make mistakes. Sometimes this approach doesn’t work, and the film just seems amateurish and ragged. But at other times it gives us moments that seem remarkably true. An uncomfortable silence that says more than any words could. An awkward gesture that reveals a character’s insecurity. These sparks struck by accident illuminate the film. They give it an immediacy we don’t often see on the screen. Shadows has been praised for its originality, and in some ways it did blaze new trails. But Cassavetes had his influences, and to a degree the film was an outgrowth of trends that had begun to develop in the late forties. After WWII, many filmmakers had started to venture away from soundstages and shoot their movies on real locations. Europeans, especially the Italian Neo-Realists, had forged a new kind of filmmaking that was rooted in everyday life. And in New York in the fifties there was a growing movement to create an independent cinema. Morris Engel, Shirley Clarke and Lionel Rogosin had all made low-budget films using actual locations. The film centers on three siblings living together in New York. The three are played by Hugh Hurd, Ben Carruthers and Lelia Goldoni, and the actors’ first names are adopted by the characters in the film. Hugh is the oldest, a singer who’s having trouble getting gigs. Ben, in the middle, plays trumpet, though he’s more interested in partying than making music. And Lelia, the youngest, seems to just be trying to find herself. Shadows doesn’t have a central story. Or rather, it tells a few different stories, and they overlap in interesting ways. The characters hang out in bars, go to parties, make love and have fights just like real people do. The film doesn’t build to a conventional climax. There’s no tidy resolution at the end. Hugh, Ben and Lelia just go on with their lives. The music in Shadows is by Charles Mingus and Shafi Hadi, but apparently recording the soundtrack was just as chaotic as the rest of the production. From what I’ve read, Cassavetes wanted Mingus to compose the score, but apparently the two had a series of disagreements, which may have had to do with money or deadlines or both. No two accounts I’ve read agree on the details, but little of Mingus’ music ended up in the final film. Apparently Cassavetes worked with Hadi on recording the sax solos that make up most of the score. However difficult the process was, the end result gives the movie a tone that is absolutely unique. The cues are discrete pieces, reflecting the mood of the individual scenes. And the freedom we hear in the music is completely in tune with the spirit of the movie. It doesn’t tell us what to feel. It allows us to feel.